Need-to-Know Tips for Exploring Seoul’s Royal Palaces! Among Seoul’s numerous attractions, the sites that continually draw in tourists are none other than the four palaces of Gyeongbokgung Palace, Changdeokgung Palace, Changgyeonggung Palace and Deoksugung Palace, as well as Jongmyo Shrine. At these locations, visitors can easily glimpse the beauty and culture that lasted over 500 years during Korea’s historic Joseon Dynasty (1392-1910). The palaces may all appear similar to the untrained eye, but spend more time here and you will see that each palace has its own charm and story. Visit the four palaces and Jongmyo Shrine for a closer look at the rise and fall of the royal family of the Joseon Dynasty. There were multiple palaces built for a variety of reasons. When one palace was under repairs, the royal family could move to another, equally comfortable location. In the case of political change, the new ruling family would wish to create a fresh start by living in a new location. 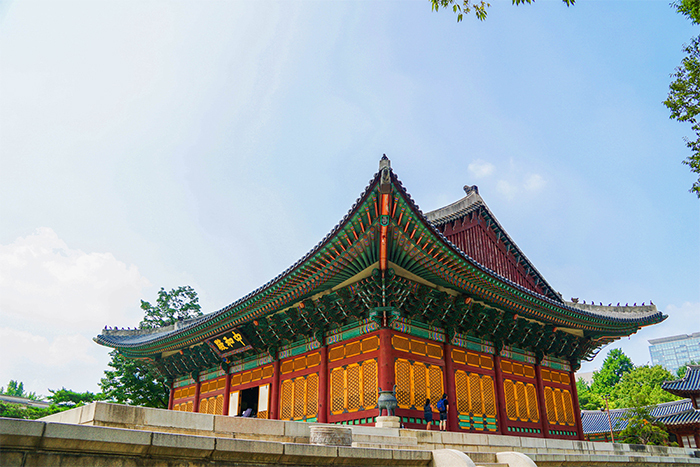 For these many reasons, Seoul has more than one palace. The king lived at the main palace, known as the legal palace, or beopgung in Korean, while the secondary palaces were referred to as yigung. Each palace is divided into an inner area, where the king and royal family lived, and the outer area, where royal rulings were conducted with the royal officials and where ceremonies and events were held. The outer area contained the palace’s main building, Jeongjeon Hall, the king’s private office, Pyeonjeon Hall, and the buildings where the scholars worked. In addition, most palaces had a rear garden with lotus ponds and pavilions where the king and royal family could relax. 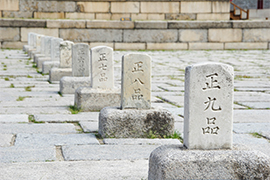 During the Joseon Dynasty, government officials were divided into 18 ranks. Pumgyeseok were engraved stones placed in the open plaza before Jeongjeon Hall in the order of official rank to organize the scholars during royal meetings. Facing Jeongjeon Hall, the scholars to the right were civil servants, while the scholars to the left were military officers. Dancheong refers to the five colors of blue, red, yellow, white, and black which were used in various designs to decorate wooden buildings. Originally applied to protect the wood from damage caused by insects and the weather, dancheong can most often be seen at palaces and temples throughout Korea. The drawings and patterns varied by the use of each building, but common designs included symbols to prevent fire and evil spirits. Constructed first among the Joseon palaces, Gyeongbokgung Palace was the representative legal palace of the Joseon Dynasty. The original palace, completed in 1395, was destroyed by fire during the Imjin War (592-1598), and remained in a state of disrepair for approximately 270 years. It wasn’t until the end of the Joseon Era in 1867 that it was reconstructed to show the grand majesty of the royal family. Later, during the Japanese occupation, the majority of the palace was destroyed again. In 1990, a detailed plan was created for the complete restoration of the palace. The work on Gyeongbokgung Palace’s main gate, Gwanghwamun Gate was finally finished in 2010. 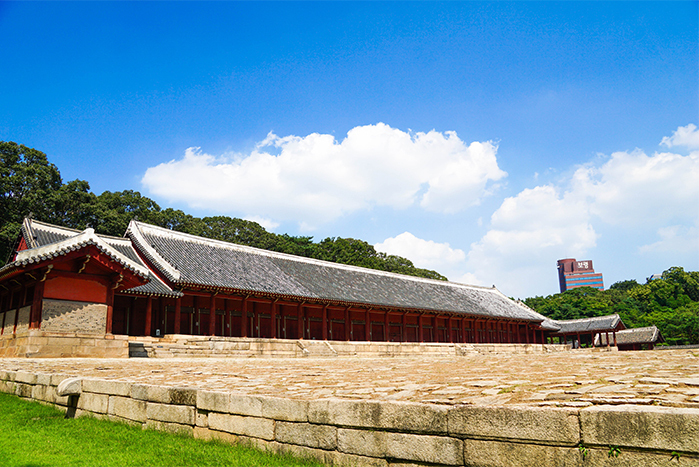 Entering Gwanghwamun Gate, the first thing your eyes will set upon is Korea’s largest wooden structure, Geunjeongjeon Hall. Used for the coronation of kings and for important court events, this hall was the physical representation for the power of the king. The buildings behind Geunjeongjeon Hall include Sajeongjeon Hall and Gangnyeongjeon Hall, the king’s private quarters, and the queens quarters of Gyotaejeon Hall. Leaving Geunjeongjeon Hall to the left will lead directly to Gyeonghoeru Pavilion, which was used for banquets and entertainment. A two-story, open-walled pavilion appearing to float over a man-made lotus pond, the pavilion is one of Gyeongbokgung Palace’s most attractive locations. Admission to Gyeonghoeru Pavilion requires a separate application, but the panoramic view of Seoul and the mountains offered from the second level is well worth the extra step. The special tour is limited to 40 minutes, but there is no extra fee charged. International tourists interested in signing up can make a reservation via phone call to +82-2-3700-3904 (foreigner exclusive line). Changdeokgung Palace, west of Gyeongbokgung Palace, was built in 1405 as a secondary palace for King Taejong, the third king of the Joseon Dynasty. Changdeokgung Palace’s most outstanding charm by far is the use of nature throughout the palace. Perfect harmony is achieved between the buildings and gardens, as well as with small stones and trees placed artfully in open spaces. The beauty of the extensive gardens made this palace more popular than Gyeongbokgung for the Joseon kings to spend their time, making it the longest lived-in residence of all the Joseon palaces. Changdeokgung Palace is the most well-preserved of the four palaces in Seoul, and was designated a UNESCO World Heritage in 1997. At the eastern most end of the palace is Nakseonjae Hall, a simple building built for the royal consort of Joseon’s 24th ruler, King Heonjong. It was also the final residence of Joseon Dynasty’s last princess, Princess Deokhye. Surrounded by hills and mountains, Changdeokgung Palace’s Huwon, or back garden, is the largest garden of all the royal palaces, and offers amazingly beautiful views. As expected, the buildings in the garden are in perfect balance with the surrounding nature, appearing to be merely an extension of the earth and trees. The garden was a site for official events like government exams, as well as for casual conversations between the king and his servants. Located in Changdeokgung Palace’s Huwon, Yeongyeongdang Residence is simple and understated in comparison with the royal residences at other palaces. The building was constructed in the style of Joseon’s yangban (aristocracy) houses, and was commonly used when the king and queen entertained guests. 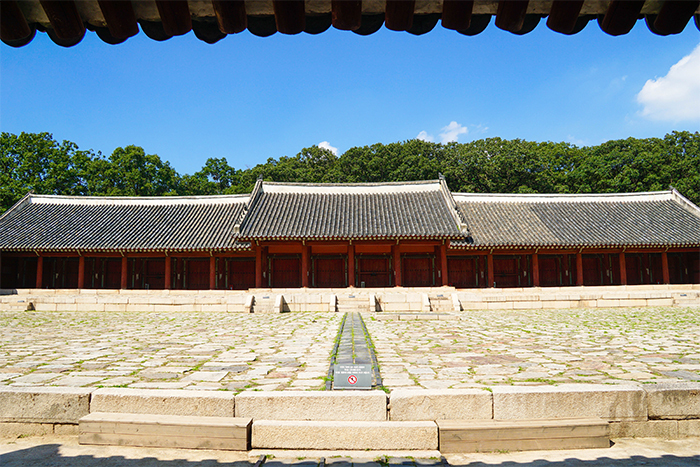 Major attractions of Changdeokgung Palace like Injeongjeon Hall and Nakseonjae are open to self-guided tours, but the Huwon is only accessible by signing up for a guided tour. Reservations can be submitted online or on-site, with docents speaking Korean, English, Japanese, or Chinese depending on the time. As a special treat, the palace is opened for a guided tour from Donhwamun Gate through the rear garden every spring and fall during the Moonlight Tour at Changdeokgung Palace. Purchasing tickets for this event can be quite competitive; not only does the tour include a docent who can explain the history and culture of the palace, participants will be treated to dagwa (traditional refreshments) while watching a performance of traditional dance and music. ☞ Directions: Anguk Station (Seoul Subway Line 3), Exit 3. Walk approx. 500m. Changgyeonggung Palace was built during the reign of Joseon’s 9th king, King Seongjong, as a residence for his grandmother, mother, and other elders of the royal family. 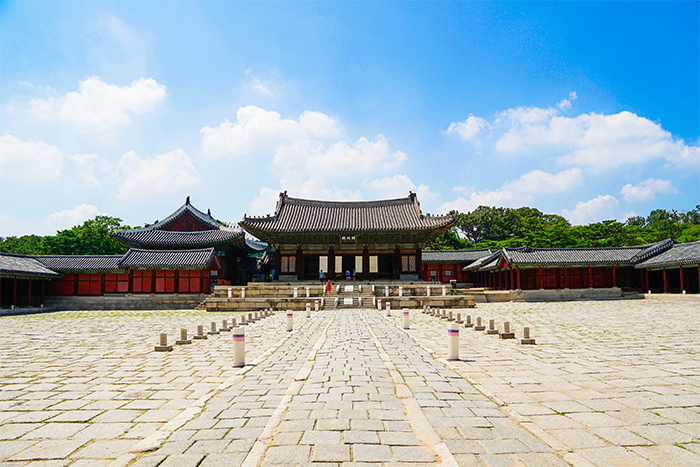 It was built near Changdeokgung Palace, making it easy for the elders to travel between the two locations. Because it was largely planned for use by the family, the living quarters take much more space than the government section of this elegantly sized palace. 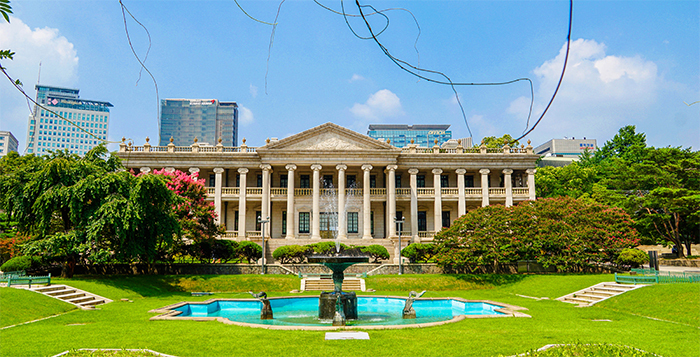 Because of this unique use of area, the palace has more stories of family issues than political scandals, from filial devotion, to love and hatred between the king and crown prince and discord between the queen and royal consorts. 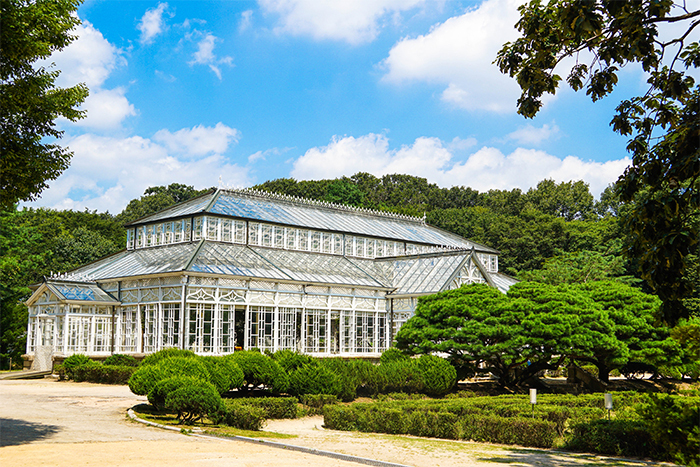 The greenhouse at Changyeonggung Palace, built in 1909, was the first Western-style greenhouse in Korea. Exuding a romantic ambience, the greenhouse is a popular date spot for couples and a photo op location for tourists. Admission is currently prohibited until November 2017 for maintenance work, but visitors can still enjoy the beautiful exterior of this glass and white famed greenhouse. ☞ Directions: Hyehwa Station (Seoul Subway Line 4), Exit 4. Walk approx. 800m. 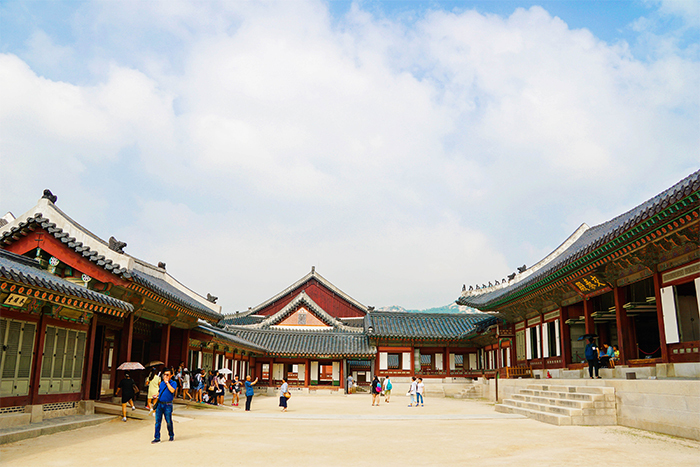 Originally called Gyeongungung Palace, Deoksugung Palace was the second most-used palace of the Joseon Dynasty. Gyeongungung Palace was first used as a temporary palace by the 14th king, King Seonjo, after the Imjin War (1592-1598). 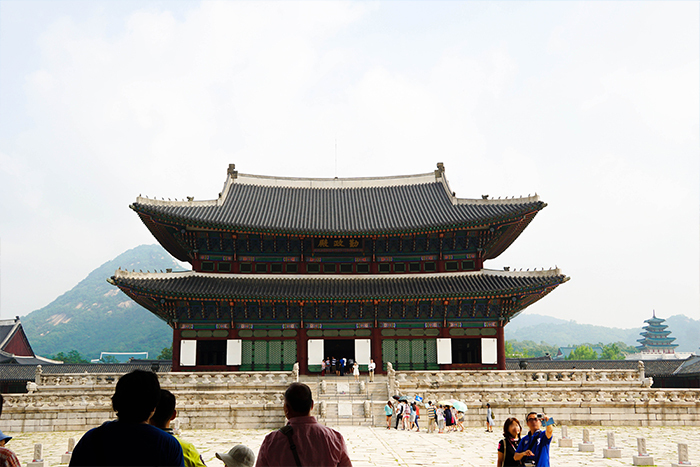 It was not until the reign of the 26th ruler, King Gojong that it became the legal palace. The name changed to Deoksugung Palace when King Gojong stepped down from the throne for the accession of Sunjong, the last king of the Joseon Dynasty. Designed by a Russian architect, Jeonggwanheon Pavilion is a beautiful mix of Korean and Western styles with a name carrying the meaning of “a space to quietly view the world.” King Gojong would come to this pavilion when worried about the nation’s increasing insecurity to sit and consider solutions. Seokjoseon Hall was completed in 1910 and is the most outstanding of the Western style buildings constructed during the end period of the Joseon Dynasty. The building has two floors, as well as a basement that was the living space of the chamberlains. The first floor contained the public area of the Imperial family, while the second floor was the Imperial family’s private living quarters. These days, the basement is open for public tours, while the first and second floors require requesting a docent through online reservation in advance. Of the four royal palaces in the city, Deoksugung Palace is often the most crowded with visitors, being both a cultural heritage and a wonderful place to relax. ☞ Directions: City Hall Station (Seoul Subway Line 1, 2), Exit 1. Walk approx. 100m. Jongmyo Shrine holds the ancestral tablets of kings and queens of the Joseon Dynasty, a kingdom founded on Confucian rule. With the lack of ornamentation, Jongmyo Shrine can appear rather dull next to the splendor of the royal palaces, but this simplicity was intentional in order to create an atmosphere of dignity and sanctity befitting a shrine. For is importance in traditional Korean structures, as well as historical and artistic value, Jongmyo Shrine was designated a UNESCO World Heritage Site in 1995. When entering Jongmyo Shrine, you can’t help but notice the three-tiered road. This path is called Samdo Road, and was the path walked on by the spirit, the king, and the crown prince. The highest level, called sin-ro (spirit road), was exclusively for use by the spirit of the deceased kings and queens; not even the current king could step foot on this level. To the right of the sin-ro was the path for the king, and the left path was for the crown prince. 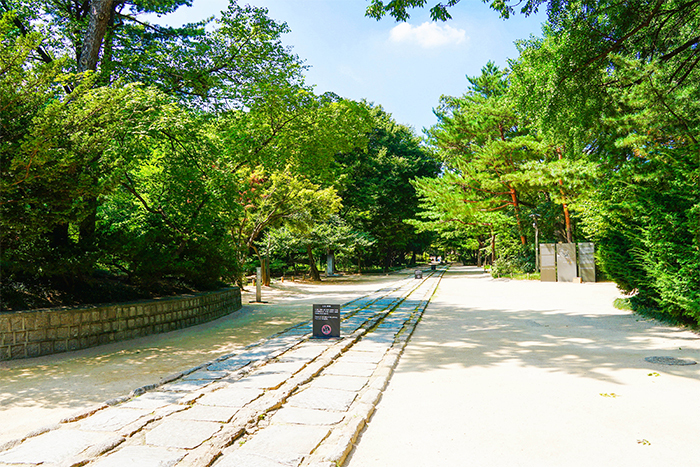 To protect and respect this important cultural heritage, visitors to Jongmyo Shrine are also prohibited from walking on Samdo Road. Following the Samdo Road will lead to the entrance of Jongmyo Shrine’s main building, Jeongjeon Hall. With a length of 101 meters, Jeongjeon Hall is Korea’s longest wooden building. The hall houses the ancestral tablets of 19 kings, including the founder of Joseon, King Taejo, as well as 30 queens. Joseon had a total of 27 kings but only 19 of them were deemed to have made great achievements and were considered virtuous. The tablets of these 19 kings and their wives alone were gathered at Jongmyo Shrine. Jeongjeon Hall was too small to house all of the ancestral tablets so Yeongneyongjeon Hall was built beside Jeongjeon Hall. The two buildings may seem identical, but closer inspection will reveal that the roofs are different, as well as Yeongnyeongjeon Hall being smaller in size, holding only 34 tablets. The tablets held in Yeongneyongjeon Hall belong to the kings who either left behind no great works or who ruled for a short period of time. To this day, Jongmyo Shrine continues to hold memorial services to the spirits of the royal family through Jongmyodaeje. Held on the first Sunday of May each year, the music and dances performed at Jongmyodaeje are called Jongmyo Jeryeak. These performances were so unique to Korea that they were added to the UNESCO Intangible Cultural Heritage of Humanity list in 2001. Jongmyo Shrine is only open to public visits on Saturdays and the last Wednesday of each month. Admission at all other times requires joining a guided tour. The tour schedule rotates between languages including Korean, English, Japanese, and Chinese. ☞ Directions: Jongno 3(sam)-ga Station (Seoul Subway Line 1, 3, 5), Exit 11. Walk approx. 200m. 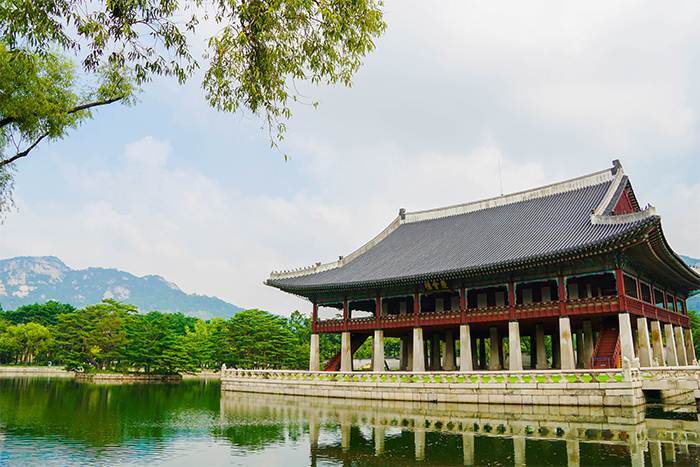 If you are looking for the most cost-efficient way to tour Gyeongbokgung, Changdeokgung (including Huwon), Changgyeonggung, and Deoksugung Palace and Jongmyo Shrine, then be sure to purchase the combination ticket. Available from the ticket book at all four palaces and the shrine, the ticket costs 10,000 won for adults and 5,000 won for teenagers and children and is valid for three months. 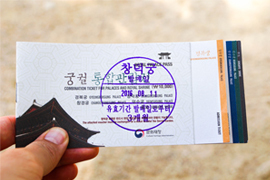 One point to take special care of is that the ticket included admission to Changdeokgung Palace’s Huwon but visitors will still need to apply for the tour either online or on-site. Seoul’s four palaces and Jongmyo Shrine each operate guide programs with docents who are knowledgeable in their area and experienced at explaining the history and culture in a fun and easy-to-understand way. Taking advantage of these programs is highly recommended to get the most out of your time. The guides are free with admission and are available in Korean, English, Japanese, and Chinese. The hours vary by palace and language so be sure to check the schedule in advance when planning your trip. Gyeongbokgung, Changdeokgung and Changgyeonggung Palaces open for special nighttime admission throughout the year (Moonlight Tour of Changdeokgung Palace is a separate event). During this special period, admission is generally extended until 10 PM, with tickets being available on-site for foreign visitors. The dates of these special periods vary each year and by palace so if you’re interested in visiting in the evening, be sure to check the dates in advance!